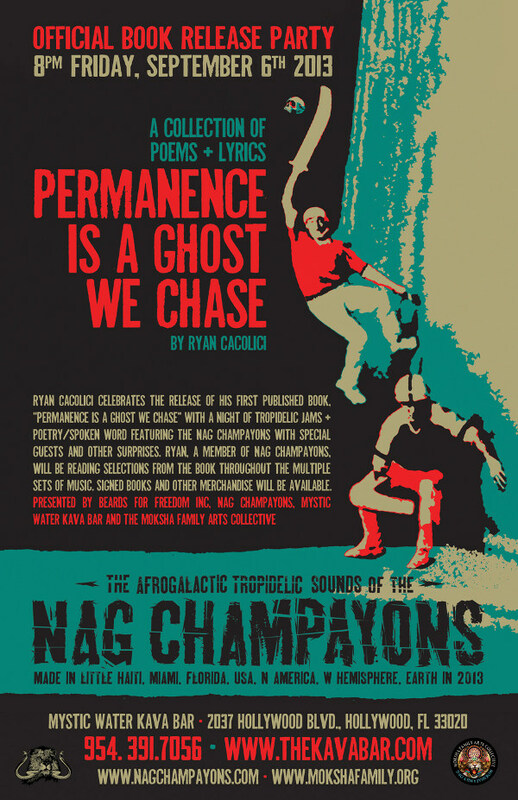 On Friday, September 6th, Ryan Cacolici celebrates the release of his first published book, “Permanence is a Ghost We Chase” with a night of tropidelic jams & poetry/spoken word featuring the Nag Champayons with special guests and other surprises. Ryan, a member of Nag Champayons, will be reading selections from the book throughout the multiple sets of music. This will coincide with the floating monthly event “Psychedelic Jazz Practice”. Set among the twisted vines & roots of Young Circle’s most ethereal interior space, Mystic Water Kava Bar, the stripped down quintet comprised of Jose Elias, Edwin Cardona, Ryan Cacolici, Kenneth Metzker and Komakozie bring the tropidelic afrogalactic grooves of the Nag Champayons to new heights with high energy improvisations & ambient soundscapes. In this retrospective volume we see the accomplished visual artist and musician Ryan Cacolici reveal another side of himself and his experience on Earth. His unconventional and experimental approach to both visual and musical realms have pushed the limits, blurring the lines of perception between the analog world and our increasingly digital environment, daring the audience to distinguish between the two. Now Cacolici’s words are seen in print still retaining some of the themes and aesthetics observed in other mediums. Predominately existential and apocalyptic visions where nature and technology merge on the same plane. At times he laments the questions of being and the future of humanity while finding softer moments to express the bliss of love and fatherhood. There is also a dark sense of humor running throughout the work challenging the political, metaphysical and moral ideals of our time. © 2013 Beards for Freedom Inc.